Are Millennials Too Conservative with Their Money? One of the more interesting bits of information that has come in my way recently is a report from UBS about investors and generations. According to this report, Millennials might be too conservative with their money. 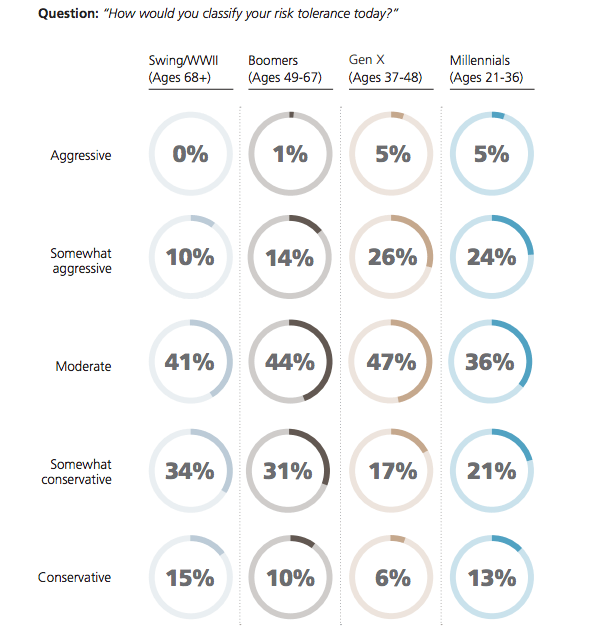 As you can see, Millennials are fairly conservative when it comes to money management. The report goes on to point out that many Millennials are worried about retirement, but that they are also leery of stocks. Why Are Millennials Concerned About Risk? The events I’ve witnessed and been influenced by, including the tech bubble burst as well as the financial crisis, haven’t led me to shun equities as many Millennials apparently have. Instead, I make use of index funds and ETFs. It’s the act of individual stock picking that I eschew. I love stocks — as long as they are part of a larger investment product. Being conservative with your money isn’t all bad. Conservative financial practices, such as living within your means and getting rid of debt, can benefit you in the long run. However, being too conservative with your investments can come back to haunt you in recent years. UBS says that Millennials are worried that they won’t have enough for retirement. Unfortunately, they are probably right — as long as they stay away from equities altogether. The reality is that the return from a savings account, even though it is safe due to FDIC and NCUA insurance, isn’t enough to help you build an adequate nest egg. In fact, once you factor in inflation and taxes, most savings accounts lose you money in real terms. In fact, even Treasuries, which are also considered safe and may come with a higher yield than a savings account, might not even be sufficient to overcome interest and taxes. A too-conservative approach with your investments can lead to trouble down the road. UBS says many Millennials are reluctant to invest in company retirement plans, and that could hurt them. These plans come with tax advantages and with the potential for better growth. Part of the problem is that Millennials are notorious for failure to look ahead (in reality, most humans have a hard time putting the future into context), and it’s hard to see beyond the problems of right now. However, a good start for Millennials is understanding how they can benefit from investing in stocks via index funds, and learning that they need to take the long view of stock market performance, rather than getting hung up on current challenges.